Welcome to The Villages Motor Racing Fan Club website! You are cordially invited to view the pages in our site, all of which have been designed to keep our members and interested parties up-to-speed (pun intended!) on who we are and what we do. Our next meeting is May 1 at Colony Cottage Recreation Center, going green at 7 p.m.
We are incredibly privileged to have NASCAR Hall of Fame member Rex White as our guest speaker. 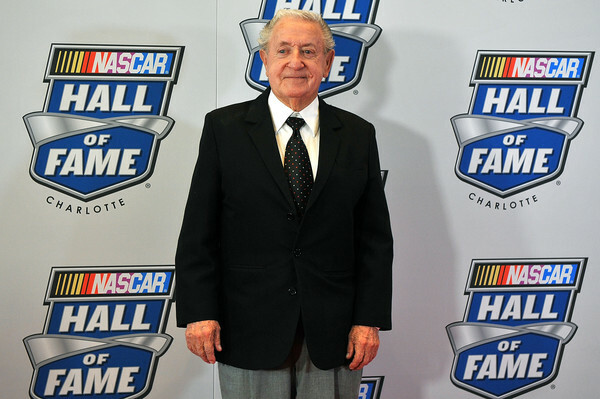 White earned 28 career wins over nine years (1956-1964), including the 1960 Cup Series Championship as one of the original members of Chevrolet's NASCAR racing team. Heralded as one of NASCAR's 50 Greatest Drivers, Rex won 28 races, recorded 163 top-ten finishes and qualified for 36 pole positions with 233 starts. In addition to the 1960 championship, in the same season White also won the Most Popular Driver award as well as the Driver of the Year award. Rex is a member of many halls of fame, including the National Motorsports Press Association Hall of Fame, the International Motorsports Hall of Fame and the Georgia Racing Hall of Fame. Meetings are open only to club members. Villages residents interested in joining should Click Here for more information. RICHMOND – Truex held off Logano over the final three laps to win - his first Cup win in 81 starts on short tracks. No one picked the winner and our standings didn't change much. Four races remain in the Spring Segment. Wins mean everything. The top three will transfer to the Playoff Segment. Click on the PREDICTION ROW tab at the top of this page so you can keep up with the competition from race to race. And check the notes at the bottom for an explanation of scoring.